This week in Chicago, the Array of Things team begins the first phase of the groundbreaking urban sensing project, installing the first of an eventual 500 nodes on city streets. By measuring data on air quality, climate, traffic and other urban features, these pilot nodes kick off an innovative partnership between the University of Chicago, Argonne National Laboratory, and the City of Chicago to better understand, serve, and improve cities. Array of Things is designed as a “fitness tracker” for the city, collecting new streams of data on Chicago’s environment, infrastructure, and activity. This hyper-local, open data can help researchers, city officials, and software developers study and address critical city challenges, such as preventing urban flooding, improving traffic safety and air quality, and assessing the nature and impact of climate change. In the first phase of the project, 50 nodes will be installed in August and September on traffic light poles in The Loop, Pilsen, Logan Square, and along Lake Michigan. These nodes will contain sensors for measuring air and surface temperature, barometric pressure, light, vibration, carbon monoxide, nitrogen dioxide, sulfur dioxide, ozone, and ambient sound intensity. Two cameras will collect data on vehicle and foot traffic, standing water, sky color, and cloud cover. The first two nodes were installed last week at the intersections of Damen and Archer Avenues and Damen Avenue and Cermak Road, where they will collect information on weather, traffic, and air quality. A total of 500 nodes will be installed across Chicago by the end of 2018, and additional nodes will be shared with cities across the United States and in countries such as England, Mexico, and Taiwan. Initial node locations and data applications were determined based on interactions with community organizations and research groups. Eight nodes in Pilsen will contain sensors for tracking air quality and its relationship with asthma and other diseases. 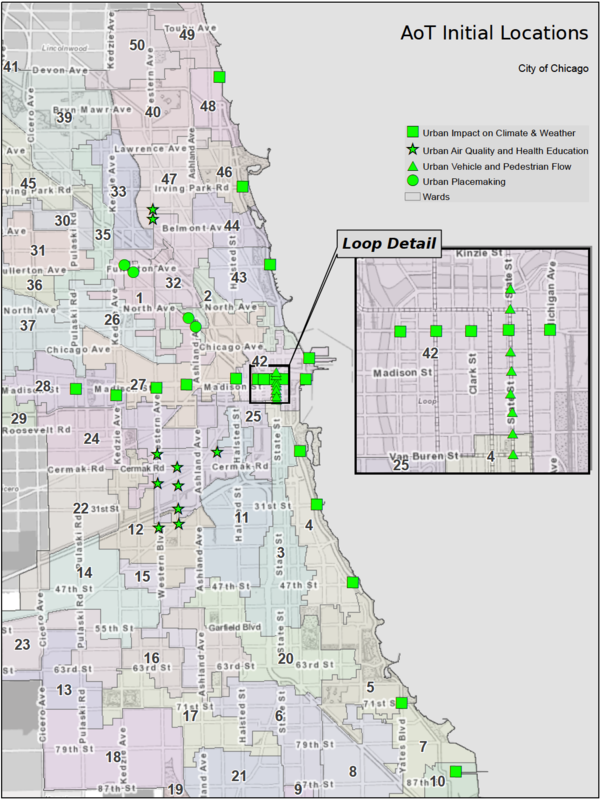 Partnerships with the Chicago Loop Alliance and Vision Zero motivated studies of pedestrian and vehicle flow and traffic safety in The Loop neighborhood. And scientists at UChicago and Argonne chose locations along the lake and across the middle of Chicago that will allow for optimal measurements of features related to urban weather and climate change. Array of Things will also support City of Chicago efforts to provide smarter and proactive services using predictive analytics and data-driven policy. For example, by tracking the weather conditions leading up to flooding at intersections, city crews can respond more quickly to floods or make infrastructural changes that prevent standing water from accumulating. City departments could also use data on heavy truck traffic and air quality to make decisions about commercial routing that preserves clean air and safe roads in residential neighborhoods. Data collected by Array of Things nodes will be open, free, and available to the public, researchers, and developers. After a brief period of testing and calibration, the project will publish data through the City of Chicago Data Portal, open data platform Plenar.io, and via application programming interfaces (APIs). As specified by the Array of Things privacy and governance policies, no personally identifiable information will be stored or released by sensor nodes. Array of Things is funded by a $3.1 million grant from the National Science Foundation, with additional investments from Argonne and the Chicago Innovation Exchange. The underlying software and hardware uses the Waggle sensor platform, designed by Pete Beckman, Rajesh Sankaran, and Catlett at Argonne. The node enclosures were designed and manufactured by Product Development Technologies in Lake Zurich, IL, from original designs by Douglas Pancoast and Satya Mark Basu of the School of the Art Institute of Chicago. AT&T is the project’s communications partner, providing all AoT connectivity for Chicago. Array of Things technology was developed with help from industry partners who provided in-kind engineering expertise, including Cisco, Intel, Microsoft, Motorola Solutions, Schneider Electric, and Zebra Technologies. For more information on Array of Things, or to suggest a future research question or node location, visit arrayofthings.us.